Pam Umberger has been teaching horseback riding lessons for over thirty years and carriage driving lessons for over fifteen years. As the owner and operator of Copper Crest Farm, which includes an indoor riding area, two outdoor riding/driving areas and over 100 acres of pasture and wooded trails, Pam offers training of most breeds in English or Western riding, private and group riding lessons, and carriage driving lessons. She is also available for private training clinics and as a guest speaker for clubs and organizations. 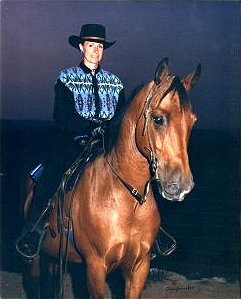 Pam taught courses in equine studies at Wytheville Community College for over twenty years, including such classes as Fundamentals of Riding, Equine Behavior and Training, Principles of Riding Instruction, and Beginner, Intermediate, and Advanced Equitation. For several years, Pam also taught Equine Behavior and Training at Virginia Tech, a required course in which Pam and her students were responsible for preparing the horses sold in the yearly Hokie Harvest Sale held in October at Virginia Tech. Pam's book, Principle-ly Horses ~ A Training Manual, was used for this class. Pam's clinics attract people from across Virginia and surrounding states. She specializes in working with riders and their horses, building self-confidence with timid horsemen and horsewomen. Her behavior Modification Clinics have helped many owners have happier relationships with their horses. She works with all breeds - minis, light horses, including gaited breeds, and draft horses. Driving clinics range from starting beginning drivers to driving pairs, tandem, randem, unicorn, three-abreast, and four-in-hand. Pam and Copper Crest students have presented demonstrations at educational events and charity fund-raisers. The Copper Crest Driving Drill Team with four horses and carts performed impressive driven maneuvers to music. Pam demonstrates driving various combinations of horses including the challenging randem (three horses hitched in a line) and ridden tandem (riding one horse while driving another horse). Pam Umberger is now a member of the Appalachian Authors Guild: This non-profit alliance is made of authors of every genre who have a connection with the Appalachian Mountains. Principle-ly Horses ~ A Training Manual is a collection of training principles and illustrated examples of how to apply them. This book has been used as a classroom text for the Equine Behavior and Training course at Virginia Tech. Life After Hitching ~ A Guide to Training Your Horse to Drive is a step-by-step approach to training a horse to drive with illustrations showing the methods discussed.